NHL Prospects Weekly Spotlight: Seattle Thunderbirds F Mathew Barzal was selected 16th overall by the New York Islanders in 2015. He’s coming off 88 points in 58 games in 2015-16 and has 58 points in 31 games in the WHL since re-joining his junior club after a short NHL stint to open the year. In this edition of our NHL prospects weekly spotlight, we’ll be looking to the west coast (WHL) of the Canadian Hockey League with Seattle Thunderbirds forward Mathew Barzal. Originally selected 16th overall in the first round of the 2015 NHL draft, Barzal has spent the last four seasons with the Thunderbirds. Throughout his Western Hockey League career thus far has played a total of 192 games scoring 257 points and 40 playoff points in 33 games. Barzal is a top-notch player equipped with tremendous stickhandling abilities as well as puckhandling and poise. Barzal also has great vision to where he’ll make a great first pass or set up his teammates for amazing scoring chances. He’s not just a passer, though, he can also shoot the puck due to his excellent release and accuracy. What makes Mat an even better player is that he plays a full 200-foot game, he backchecks just as hard as his forecheck and will also cut off passing lanes as well as block shots. 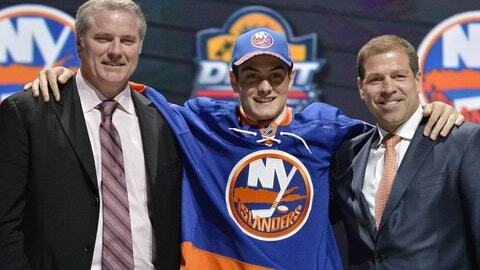 So the Islanders certainly have themselves one of the better NHL prospects, and speaking of New York, Barzal managed to stick it out this season for two games before being sent back down to the WHL. He didn’t register a single point however but showed a lot of offensive promise which will most likely be on full display next season. Barzal is on pace to set his highest offensive output this season, which was previously 88 points in 58 games last season. This week Barzal and the rest of the Thunderbirds have games against Tri-City, and then back to back games against Portland.